News and information on non-traditional home options. Can You Refinance Your Manufactured Home? Rates are still low when it comes to home financing, and you may be wondering if you can refinance your manufactured home to get a lower interest rate or lower your monthly payment. You can also use the money you get out of refinancing your home to pay for emergencies (such as maintenance), career retraining, college funds, and the like, but be very careful and never refinance just to pay for luxury items. How does refinancing a manufactured home work? To refinance means that you take out a new loan, which pays off your previous loan, and sometimes leaves a bit extra left over. The best reason to refinance is to get a better interest rate (something that is usually possible when rates have gone down or your FICO score has gone up or if you had to take out a funky loan originally in order to quality) and owe less money each month. Also, you can refinance to a shorter term payment schedule (i.e. a 15 year fixed instead of a 30 year fixed) if you're making more money than when you purchased the home and you can now afford a higher payment and would like to own your manufactured home free and clear sooner. Keep in mind that either way you go, you will need to pay closing costs all over again when you refinance, so make sure the end result is worth that expense. It is possible to refinance both park manufactures homes and models on private land, but because these are not "normal" houses, the financing rules change depending on the state you live in. To really get the lowdown, you should visit a lender in your neck of the woods. It's not a bad idea to speak with multiple lenders to see who can give you the best rates and seems to have your best interests at heart. Cost of Insuring a Manufactured Home? If you're considering buying a manufactured home, whether a new model from a dealer or used one on an existing plot of land or in a park, it's important to consider insurance. Just as when you buy a traditional stick-built home, you need insurance to make sure you and your family are safe in the event of an emergency (and if you're taking out a loan from the bank in order to make your purchase, insurance will be required anyway). When it comes to older manufactured homes, insurance can actually cost quite a bit, but if you buy a new home today, you can expect building standards to be equal or greater than that of stick-built homes, and insurance rates reflect this. Whether with an old unit or a new unit though it is still a good idea to get a quote before making the purchase. That el cheapo model you're eyeballing as a good deal may actually cost a lot to insure, because it wasn't built to today's standards. Read articles such as this one on manufactured home insurance and check with your bank and the local insurance companies for more information. Just as with other types of insurance, it's smart to get quotes from several agencies before settling on one. What's the Difference Between Modular Homes and Manufactured Homes? If you're looking for affordable housing, you may have been pointed to manufactured homes or even modular homes. Both tend to cost less than traditional stick-built homes, and if you have your own land, they are much cheaper to put up than working with an architect and having a home custom built (though especially with modular homes you can get some customization). But what's right for you? Manufactured homes and modular homes aren't the same. Manufactured homes (AKA mobile homes) are the ones you may have seen cruising down the highway on the back of a truck. They are built on a non-removable steel chassis and must be compact enough to fit on the back of a flatbed truck (though you can get "double wide" or "triple wide" manufactured homes that are fastened together when they reach the home site). These mobile homes must be built to standards of the HUD building code. Manufactured homes have low roofs (after all, they have to be able to go through underpasses and what not when they are on the trucks), and they are all single-story. You won't get a basement with a manufactured home. Modular homes are much more like traditional stick built houses. They are constructed according to local state/city building codes, and the main difference is that they are built in pieces or modules in a factory instead of being built from the ground up on the site. They can be assembled quickly once all the modules reach the site however. Unlike manufactured homes, modular homes can be any shape and size. They can be multi-story, and they can also have basements. When a modular homes is finished, you can't tell that it is any different from a regular house. Used Manufactured Home, Good Idea? Are you thinking about buying a used manufactured home? It can be appealing since manufactured homes are cheaper than stick built models, and it can even be a good investment if the home comes with the land it's on. If you're a first time home buyer, purchasing a traditional home, or even a condo, can be too expensive, especially if you're single and have only one income to rely upon. Even new manufactured homes (when you add in the price of buying land) can be expensive. But is buying a used manufactured home a good idea? It can be harder to get a manufactured home, especially a used model, financed. Though the overall price is lower, the bank may try to stick you with a high interest rate. Make sure to look around and get the best rates. Make sure the home can be insured. If it's too old, you may have a hard time getting insurance. Make sure you've found a good rate and insurance before signing anything. Some used homes (manufactured homes built before 1976) have aluminum wiring which is considered a fire hazard (this is one of the reasons it can be hard to get insurance). Many older manufactured homes have particle board floors, so you may have "spongy floors" to deal with. Bathrooms especially, are then susceptible to warp and rot. Used mobile homes can be prone to leaks, so make sure to check for signs of water damage on the ceilings in all the rooms. As you can see, buying a used manufactured home comes with its risks, but it can still be a good idea. It can be a good investment if you can't afford a loan on a traditional home or if you just like the idea of living cheaply! Just make sure to do your research before you buy. With the cost of housing these days, it's no wonder manufactured homes are becoming more popular. It doesn't hurt that today's models are a lot better looking than the old-fashioned, trailer-park, tin boxes we all remember. You can get manufactured homes that are as nice as stick-built houses (and less money to boot). But how do you get the best deal? And how do you make sure you're getting the best quality home for your money? 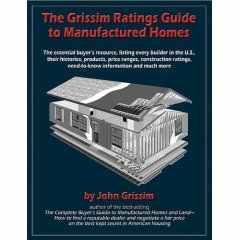 The book lists every builder in the United States, including their histories, products, price ranges of homes, and other need-to-know information. It's a $30 book that might save you a lot of money in the long run, so check it out if you're in the market. Reviews over at Amazon are positive. There are already quite a few conversations going. Looks like it'll be quite helpful. I knew you could get custom-built modular homes (houses that are assembled in the factory and come in ready-to-put-together modules to your building site), but I didn't know more and more manufactured home dealers were offering a lot of customization. And according to an article called Custom-built Manufactured Homes at Bargain Prices it may not cost all that much either. "Manufactured homes can be built with skylights, basements and most any amenity that you might find in a stick-built home. The industry gives a lot of choices for a good value. The average size ranges from 1,300 to 2,600 square feet. Most homes range from $42,000 to $48,000, but larger two-story models can typically run more than $100,000 (including land)." Considering the median home price in the United States as crept to well over $200,000 these days, that doesn't seem very bad at all. Well, you've probably heard of manufactured homes and you've heard of log homes, but what about a manufactured log home? I saw my first one today, driving by a local manufactured home dealer. They had two new houses up. One had wood siding and the other log. It was night, and I couldn't tell if the log look was inside, too, or if it was just your basic painted drywall inside. My guess is it's just a log siding (I can't see manufactured homes actually being made in the same way as a log home), but I'll take a closer look next time I go by. The dealer was http://www.gregersons.net/, which is (I think) just local to Seattle, but I'm sure if one dealer is doing the log look, others must be too. Swamp coolers -- It's never a good idea to cut a hole in the roof (leaking), and let's face it, these look ghetto. Telephone & TV Jacks -- The factory will likely install them in the wrong spot; it's better to have a professional do this for you later. Ceiling Fans -- You'll get a better deal (more selection and less money) from a local hardware store. Towel Bars & Toilet Paper Holders -- Again, you can get nicer quality ones for less at the hardware store. Metal Roofing or Siding -- Just say no. Metal roofs need to be sealed every year, and siding needs to be waxed. Wood Stoves/Pellet Stoves/Fireplaces -- You can add a stove later if you want one, but don't do it through the factory (mediocre quality and selection). If you do buy a stove, get one that vents through the wall and doesn't require a hole in the ceiling. Fancy Dining Room Chandelier -- Have the home wired for one, but buy your own at the hardware store where it's cheaper and you have a wider selection. Log/Cedar Siding -- Cool look, but do you want to seal that wood every year? Plus, the nails they use to apply the siding rust and leave stains running down your walls. Buying Land--How Much Do You Need to Grow Your Own Food? Can Prefab Houses Really Be Fabulous?